Hi all, wondering if you can help us with the old ‘which white paint’ chestnut for our new renovation? Basically it’s the south-facing wing of our house - two bedrooms and a bathroom and hallway. 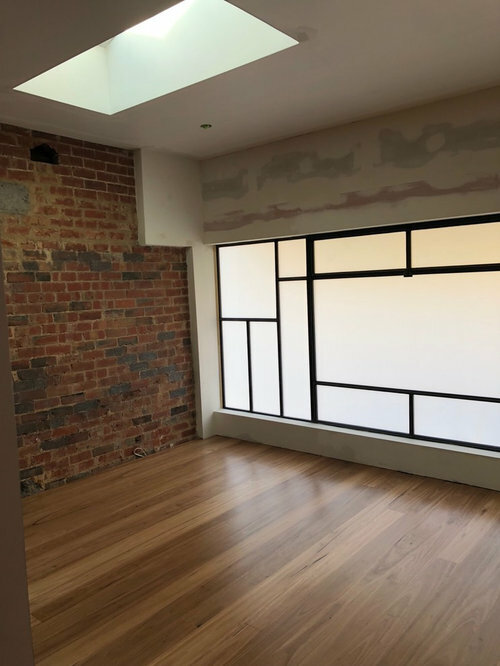 I’ve attached photos here - the master bedroom has a v large (south facing) steel window, small room has an east facing window and all three have east facing skylights. It’s quite light but everything is east-facing so it does get darker in the afternoon. We’ve got paint samples/large swatches of both warm and cool whites which we’re testing but finding it difficult to work out if the cool ones will look too grey (especially the hallway which is quite dark). Options are (Dulux) - lexicon (quarter/half), white on white, snowy mountains half, antique white, white on white, natural white. 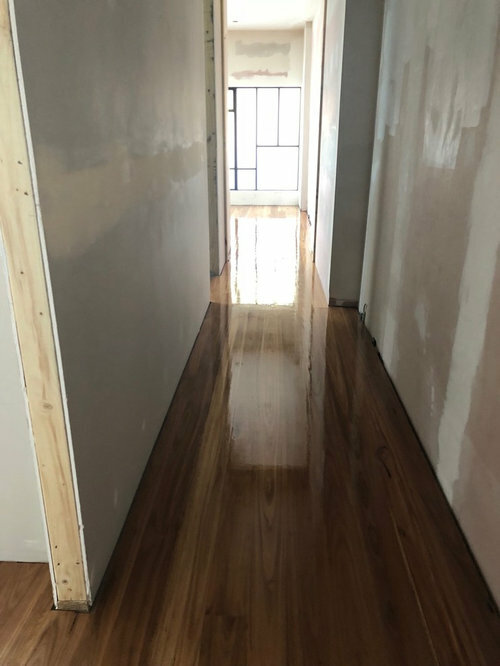 Our floors are blackbutt, so warmer toned. Would anyone have any thoughts on what is likely to work better in terms of the above? Cool or warm? Or if there’s a better ‘neutral’ white that could work as an option I’d love to hear it. I also wondered in terms of ceiling whites and trims - should we use a separate ceiling white or should we just use a version (quarter /half) of the wall paint? It seems weird to use a separate ceiling white with white walls but I wasn’t sure what’s standard. 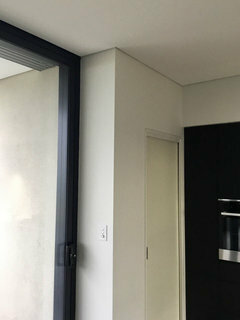 One final question...we were thinking of grey/charcoal blinds - would these make warmer toned walls look yellow? So sorry for all the questions but we are just going in circles! If you have any thoughts or suggestions we’d be so grateful. Hi girlguides (sorry I don’t seem to be able to respond direct) - thanks so much for this, that’s really helpful. I should have said - yes - we are keeping the exposed bricks too so there’s a few colours going on. Thanks for the suggestions re blinds too - really appreciate it! We went natural white with vivid white trims. 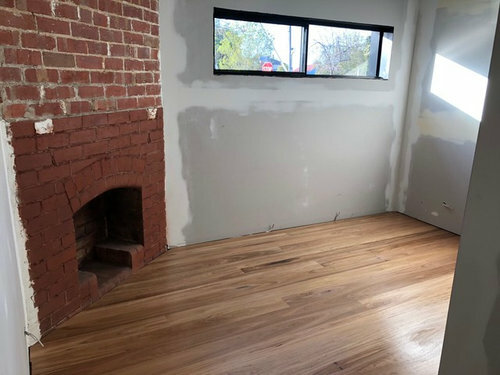 Floors are blackbutt . Thanks so much grazz. I’ve seen that combo before and it looks terrific! Can I ask what you did with the ceilings? Did you go with a ceiling white or natural white? Thanks again! I agree Natural White is a solid choice for walls and ceiling. Another is Resene’s Triple Rice Cake. Many thanks Ann, I haven’t heard of Resene but I’ll check it out ...natural white does seem to be a very good all rounder! We too have gone the ceiling white, natural white and vivid white combo! Thanks grazz and Jacqueline! Jacqueline do you have cornices? I can see in grazz’s pic that they have them - we won’t, which is also why I’m wondering whether changing to ceiling white would work for us or if we should continue with a half/quarter version of the wall:..thanks again both! Dulux Whisper white will be perfect. Obviously flat on the ceiling. We’ve done it, looks great. Grab yourself a sample pot and paint a large bit of cardboard and move it around, that way you will feel happy with your decision. I agree with girlfuides about using same white for ceiling and walls, esp as there are no cornices. I tried to find the most boring areas to show the colour better. We have used the Whisper White absolutely on everything. The ceiling, walls, skirts and doors and frames. 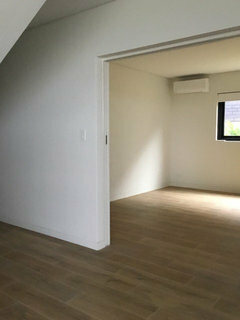 Flat on the ceiling, low sheen walls and satin on the doors, frames and skirts. It doesn’t end up looking the same because of the different lighting. 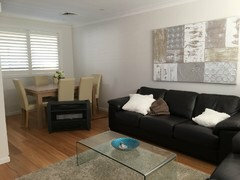 Then you add the colour in your art, furnishings and rugs. My rug is the same colour as your bricks, it will look perfect. Loving your bricks and choices, it’s going to look beautiful. Thanks everyone and thanks Tilly! Whisper White was pretty much the only white I didn’t get a sample pot of (it looks so similar to natural white to me...maybe with a hint of green??) but we will get some and give it a go. Your place looks gorgeous - thanks so much for the pics! Actually....I have one more white paint question everyone if you don’t mind! 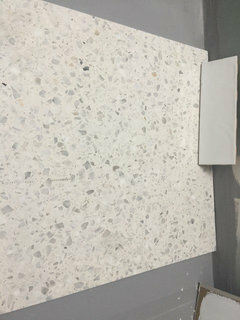 We will be using terrazzo tiles in the bathroom (off white base with Carrara marble chips) and white textured subway tiles. I had planned to paint the remaining sections of wall white too but now I’m on this white paint odyssey I’m wondering if it’s going to work or if I’d be better to go with a contrasting colour instead. If I do paint with white, should I match it back with the wall tiles? The closest colour is lexicon which is obviously pretty cold/blue - the room has a large east facing skylight but I’m concerned about it feeling a bit sterile...appreciate your thoughts! Thanks again for your help. Maria, what will the benchtop material be for this bathroom? Can u upload pic of the terrazzo? 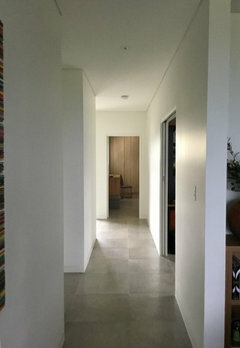 Thanks so much Ann - A pic of the terrazzo is below (with the subway tile we’ll use). It probably looks a little greyer as we only have the skylight in there at mo, no lights, and the walls are tanked out in blue/grey. Thanks too Tilly - sounds like I am definitely going to have to get some whisper white and see how we go! Who would ever have thought white paint would be so complicated...starting to go cross eyed! Thanks so much for your tips and those pics. Thanks for pic. Lovely terrazzo. It will look good as wall tile and benchtop. I have to agree with Tilly about using white. And I would use same white as you are using elsewhere. Lighting can be used to great effect in warming up & blending the various whites in your materials so they don’t have to match absolutely exactly. That’s my feeling anyway. Did you say what flooring in bathroom will be? Hi everyone, I just wanted to say a big thanks for all your help and advice! We’ve decided to go with natural white on walls in bedrooms and hallway (quarter tint on ceiling) and then we’re going to do a grey paint in the bathroom to break up the whites. I’ll try and post some pics when done; big thanks, you’ve been so helpful. best white paint? What white paint should I use?